Otaki is a town in the Kapiti Coast District of the North Island of New Zealand, situated half way between the capital city Wellington and Palmerston North, (70 kms from both). It is located on State Highway 1 and the North Island Main Trunk railway on their routes between Wellington & Auckland. The town is sited close to the banks of the Otaki River, some three kilometres from its outflow into the Tasman Sea. It is divided into three main parts, Otaki Beach which is a mainly residential area, the larger and more inland Otaki township which contains shops and residential areas and along State Highway 1 near the railway station, the part known as Otaki Railway. The surrounding district is agricultural, with market gardens and olive and grape growing. The economy of the town is largely based around service industries for the farming community. In the early 19th century, the area was inhabited by Maori of the Ngati Raukawa iwi who had migrated from the Kawhia area from about 1819, under the leadership of Te Rauparaha. They had supplanted the Rangitane and Muaupoko people. Otaki was an important refreshment and overnight stop on the early stagecoach runs between Wellington and Foxton, which used the beaches as roads. A pause at Otaki was necessary to negotiate the river, (the biggest one south of the Manawatu), by ferry. The early Anglican missionary Octavius Hadfield established his mission station in Otaki. 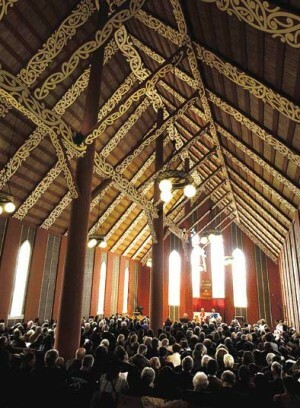 He and the warrior chief Te Rauparaha are believed to have been responsible for the building of Rangiatea Church adjacent to the mission. In 1844 the trees were felled for the church with building started in 1848. Built entirely with local timber by tribal labour the church was completed in 1851. This was the country’s most impressive church and it became a major visitor attraction. It was destroyed by fire in October 1995 and has since been rebuilt, opening in November 2003, replicating the original structure in every practical way. Organised horse racing began in Otaki in the 1850s, when every Maori pa had its own track. The Otaki Maori Racing Club was formed in 1886 and is still going strong. Inland from the township is the racecourse where the annual Otaki Maori Races are held . Waitohu Stream, a the north end of Otaki Beach. Tararua’s behind.